Genre: Young Adult, Historical, Romance. As Gretchen investigates the very people she's always considered friends, she must decide where her loyalties lie. Will she choose the safety of her former life as a Nazi darling, or will she dare to dig up the truth—even if it could get her and Daniel killed? From debut author Anne Blankman comes this harrowing and evocative story about an ordinary girl faced with the extraordinary decision to give up everything she's ever believed . . . and to trust her own heart instead. 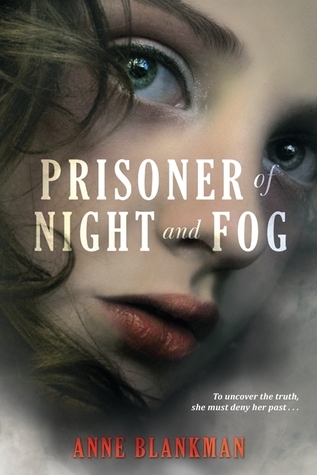 When I heard Prisoner of Night and Fog was about 1930’s Germany, it quickly became one of my most anticipated books of 2015. Like Anne Blankman, I’ve been obsessed with everything World War Two related since I read Anne Frank’s diary so this was no exception. It certainly didn’t hurt that this a really gorgeous book either. Gretchen Muller is a different sort of character. Usually in World War Two/Holocaust novels, the main character is almost always Jewish and while I love those stories, it was interesting to see another side. Gretchen and her family are in Hitler’s inner circle, which meant this was a little bit strange to read at times – the thought that people like Gretchen (who is fictional) would have seen Hitler as just a normal person is terrifying. The scenes where Hitler did appear were almost difficult to read, but it was all so beautifully written that I couldn’t tear my eyes away. Moving on from that! The story is a little bit slow to start, but it was still interesting. By the second part, it has well and truly picked up and things were getting intense. There was a bit of everything – some romance, some family issues, politics, mystery, history (ha, I rhymed) and even some psychology. There are so many layers to this story – it’s not just a story about politics in 1930’s Germany, it’s about a girl and family and loyalty and love and realising what is good and true in the world. It’s beautiful and it’s haunting. I know some people don’t ‘get’ these story, or they don’t like historical fiction for whatever reason but I think this subject, in particular, is incredibly important. This is a different look history, one that you don’t really get to see in YA very often and while it’s not as heartbreaking as a novel set in a Concentration Camp, it is just as meaningful. In other words, I beg you all to give this a shot.